This 11ft wide Embrace™ booth is an L shaped left corner display popular at trade shows and business expos. The popup frame has channel bars with recessed grooves to accept the SEG graphics. The graphic is printed dye sub on SEG push-fit fabric, we offer with or without end-caps. We suggest using endcap panels for a more finished look. The Embrace is easy to setup, the frame is collapsible and portable. This corner backdrop offers an easy and tool-less set-up. The kit includes a wheeled carry bag for easy transport and storage. About the Graphics: Printed graphics are available on any main popup frame surface. The fabric banners are custom printed with dye sublimation, this process infuses ink into the fabric for deep rich ink colors that POP. The SEG fabric graphic has a silicone edge beading that push fits into the frames recessed groove. This creates a taut smooth edge to edge graphic surface with no edge distortion. How to Setup Your Pop-up: Setting up your popup is fairly simple, more in depth instructions will come with the kit. Lay the frame on the floor and stretch open to size, snap together the locking arms. Slide on the top and bottom channel bars, stand up the display frame and install the side channel bars. Press in the graphics into the recessed groove in the frame, start in the middle then press in the remaining graphic moving out towards the corners. Repeat for the end caps or other sides. Install the stability feet into the dovetail clips if feet are required. That’s it, if setup is done correctly the graphic will fit snug and smooth and the popup booth should be straight and stable. Embrace 5ft Full Height Push-Fit Tension Fabric DisplayEmbrace™5ft full height (2 Quad x 3 Quad) is .. 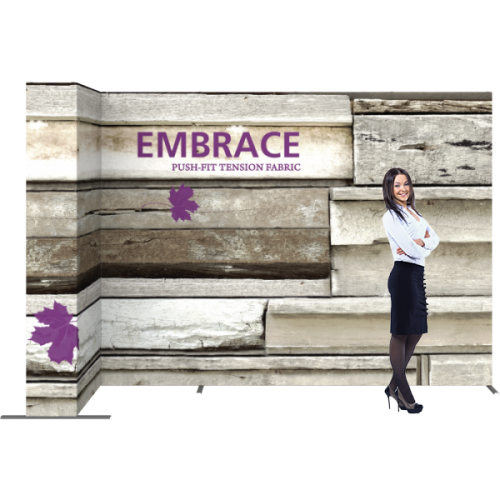 Embrace Tradeshow Display is 8ft wide and Holds Push-Fit Fabric GraphicsEmbrace Trade Show Display i.. Embrace 11ft x 7.5ft L-shape Right Corner SEG Tension Fabric DisplayThis 10ft wide Embrace™ booth is.. Embrace 10ft Wide Stacking Push-Fit Tension Fabric DisplayThe Embrace™10ft wide Stacking Push-Fit Fa.. Embrace 14 ft wide x 7.5ft tall Includes SEG Tension Fabric DisplayThis big full color printed U sha.. Embrace SEG Popup 15 ft tall x 17 ft Wide Quad Stacking Push-Fit Tension Fabric DisplayThis super ta.. Embrace CounterEmbrace™Counter is a sleek, collapsible push-fit tension fabric counter display that ..